Snowdrops studio (Galanthus), cut flower variety mixture in winter spring bulb bloom, ready for pressing pressed flower arrangement. 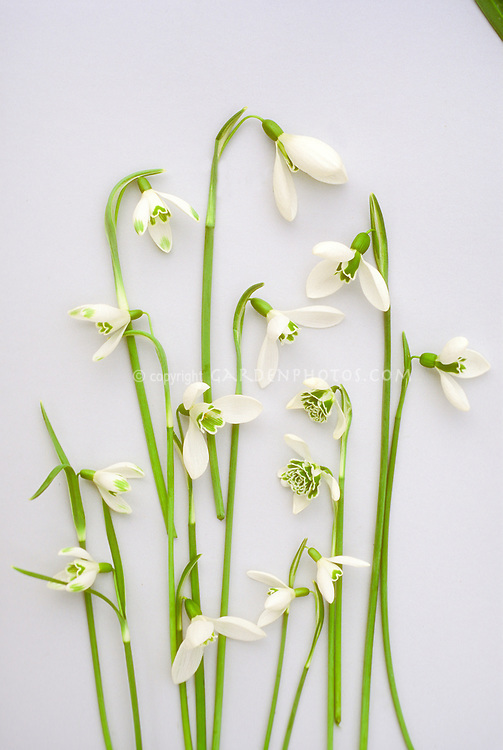 Varieties include (from top left clockwise, exteriors): Viridapice, John Gray, Merlin, Galanthus nivalis, Galanthus ikarieae, Scharlockii (twice), again Viradipce. In center from top, clockwise: Atkinsii, Ophelia (twice), Galatea.